Real talk: Many years ago, after I rediscovered my PSP, I also found a Japanese copy of Lumines. I had tried playing it at some point before, but my mind simply wasn't ready to handle this monstrosity. But now... Now was the time. I played the game furiously, and as anyone who has enjoyed the game can attest, it is very addictive. The actual purpose of the game is to take the 2 by 2 blocks that fall from the sky and attempt to group them so that one of the two colors makes a square, which is then deleted by the scanner that crosses over the screen. The twist to this is that the game frequently transitions through "skins," where the game's entire look changes. The blocks can change colors, become circles, flash brightly, whatever. The background and the music also transition. 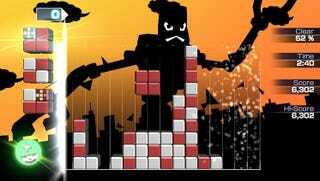 However, as the game is very fast-paced (although the actual speed of the blocks falling is determined by the skin,) there are many solid strategies that you end up learning as you play. Set these blocks like that in this combination, and you're setting up for huge chains of blocks being cleared. But while you can easily pause the game and put the console away, it's not as easy to stop the game itself from playing in your mind. Lumines literally stopped me form sleeping. I would lay awake for hours, thinking about those multicolored blocks and the best way to connect one into another to get the highest payoff. I was suffering from the Tetris effect, where game residue follows you into the real world. I ended up having to give the game up or suffer severe health and social problems. Recently, however, I picked up Lumines: Electronic Symphony for the PSVita. Everything is infinitely more vibrant than it was 7 years ago, and it's still just as addicting. Mind you, however, I'm not trying to insinuate that Lumines is working for the Devil and trying to kill you in your non-sleep. It's an absolutely fantastic game that deserves as much love as it can, but it's important to play in moderation, and to not be too fixated on the game. Stay safe out there folks, and don't compare Lumines to Tetris or you'll receive a swift kick in the shin.